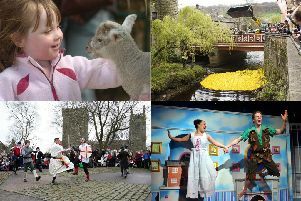 Hundreds of people flocked to Heptonstall to enjoy the village’s annual music and arts festival. With a theme of Roald Dahl, crowds showed their love for the legendary author by dressing up as their favourite characters from Dahl’s books. The event, held on Saturday, included live music on two stages from young local acts, as well as more established artists from further afield. The location provided the perfect backdrop for the day, with the main stage entertaining audiences in the picturesque ruin of St Thopmsa the Apostle Church and the acoustic stage in Weaver’s Square. And there was plenty for all the family to enjoy with a special Roald Dahl story writing competition, judged by local children’s author Liz Flanagan. There was also a family treasure trail, a fun dog show, reptile display, children’s parade and a puppet show. For the more energetic, the Heptonstall Festival Fell Race put participants through their paces as the route plunged deep into the valley, before working its way to the top of neighbouring heights of the south Pennines.